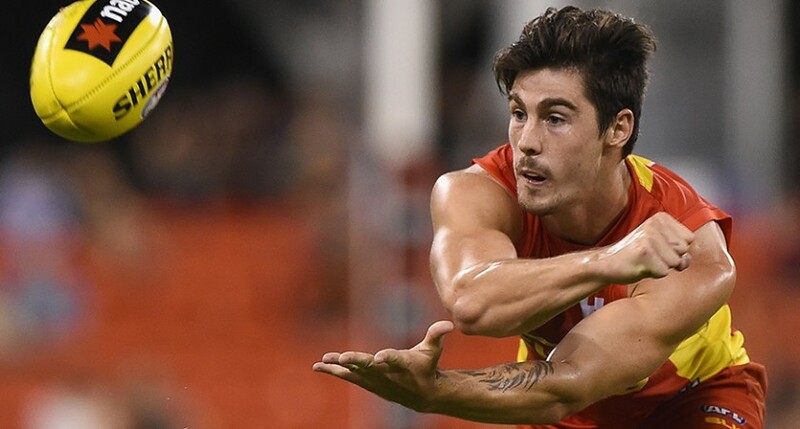 The Gold Coast Suns have eased the pain of Alex Sexton’s broken arm, extending the young Queenslander’s contract to the end of the 2019 season. Sexton, facing four-six weeks on the sideline with a plate in his forearm following a mishap in Round 7, was rewarded for an excellent start to his fifth season at the elite level. The Suns announced the re-signing of the 22-year-old Springwood and Redland utility product on Thursday night. Despite the Suns’ five consecutive losses Sexton said in a club media statement that he was thrilled to extend his future on the tourist strip. “I couldn’t be happier to re-commit to the club, and continue my AFL football on the Gold Coast,” Sexton said. “Even though we are being challenged at the moment, I see an exciting future ahead, and believe the club is heading in the right direction. We really do have such a unique opportunity to achieve something special for this city. “Having my family and friends just a 30 minutes’ drive north on the M1 motorway made the decision to re-commit a much easier one, and it’s great to always have their support so close to home. Suns List & Strategy Manager Scott Clayton welcomed Sexton’s contract extension. “We have always maintained at the fore of our recruitment strategy that we need to be a vehicle for Queensland talent; so it is extra pleasingly to have a regional player of Alex’s ilk re-sign with the club,” Clayton said. Sexton, taken as a local talent access selection at the 2011 NABL AFL National Draft, has played 44 AFL games and is considered an important part of the club’s future successes, with versatility among his many strengths. This year he has averaged 16 possessions a game and, despite missing Round 8 and much of Round 7, is third on the Suns goal-kicking list behind Tom Lynch and Jack Martin.